Do you want to type quickly with variety of words and phrases? Google Scribe is a text completion service that helps you type quickly. It provide suggestions for correct or popular phrases as you type. Word or phrase completion suggestions are provided on the basis of text already typed in the document. 1. Open Google Scribe online editor on your computer. 2. Start typing words and you should see suggestions in a pop-up window. You can manually select specific word suggestions or press number key on keyboard to quickly add specific suggested word. For example – you can add “to my” quickly by pressing number 2 key on your keyboard. 3. 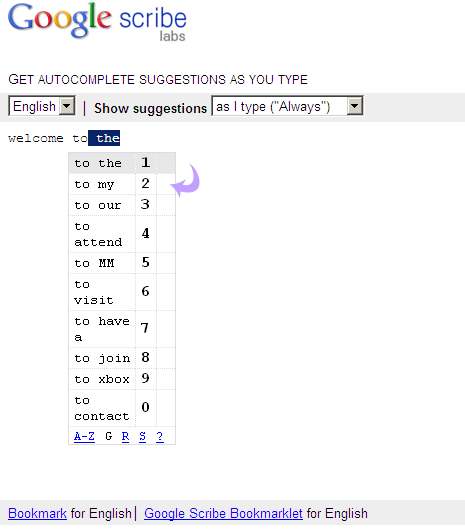 You can also configure mode of suggestion from drop down box among: as I type, on tab or never. Press ESC key to hide suggestions anytime. For sure one very cool online tool to complete your text writing spiced with variety of words and setences as a result of word / phrase suggestions.